I finished this Twin-sized quilt top this week, and I finished thread basting it moments ago. I know that most Quilters prefer basting with safety pins, but I am not entirely convinced that pin basting is easier or faster than thread basting. Maybe it’s a dexterity thing, but I find wrestling with safety pins frustrating, both while basting and while quilting. My hand basting is done in lines roughly six inches apart, with stitches between 1/2″ and 1″ long. 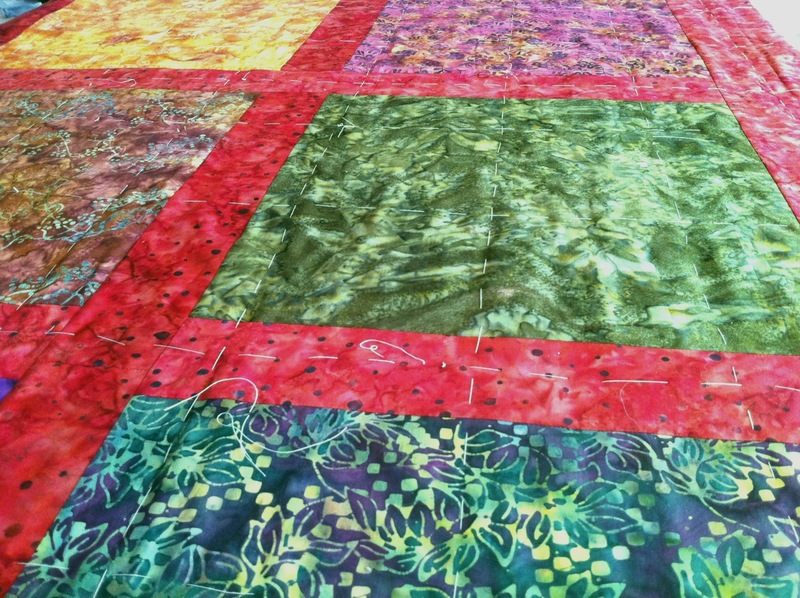 I can’t tell you how long it took me to baste the entire quilt, but I did not devote the entire weekend to the project. The bonus is that I can leave the basting in the quilt until I am finished quilting. The main down side to hand basting is having to constantly rescue my cone of cheap thread from Pauline, who still has all his very sharp claws and teeth. So, what do you think? Have you ever hand-basted? If you have, how would you compare the speed, ease, and performance of hand basting to machine basting? This entry was posted in Quilting, sewing and tagged basting, quilt, Quilting, sewing. Bookmark the permalink.